When the weather predictions call for snow measured in feet, instead of inches, my first instinct is to fire up the oven and get baking. There’s something hard wired in my brain that says copious amounts of time locked inside should be celebrated with sugar, butter, and flour. Luckily, all the ingredients for Cinnamon Cake were safely tucked away in my pantry as SNOMG (thanks Pigtown for this catchy phrase) came barreling into town. I say luckily because if you’ve ever been inside a grocery store the night before a big winter storm around these parts, you know that it’s that last place you want to be. So to kick off the first really big storm of the decade, I rocked it old school with one of the recipes in a random collection of cookbook pages that I got from my grandmother. I have no idea what cookbooks these may have been or exactly how old they are. But trust me, Cinnamon Cake stands up to the test of time. And it makes a great snack when you’ve just freed your car from 2 feet of snow. BAH Note: I get all confused when a recipe says sifted flour vs. flour sifted. To me, flour sifted means you measure then sift where sifted flour means you sift then measure. Since I have no great way to sift directly into a measuring cup, I say fluff your flour a bit then measure. Don’t be alarmed when you put the melted butter and cinnamon sugar on top of the batter. The edges of the cake will bake up around it and then it will sink through the batter in places. This end result is similar to a coffee cake without a crumb topping. Heat oven to 400 degrees. Butter and flour a 9 x 13 pan. In the bowl of a stand mixer fitted with the paddle attachment, beat the eggs. Slowly add the 1 1/2 cups sugar and continue to beat until very light. Add the dry ingredients and milk in several additions, alternating between wet and dry, beginning and ending with the dry. Add the 4 tablespoons of melted butter and mix until thoroughly blended. Pour the batter into the prepared pan and smooth it out evenly. Drizzle 5 tablespoons of melted butter over the top of the batter. Combine 1/2 cup sugar with the cinnamon in a small bowl. 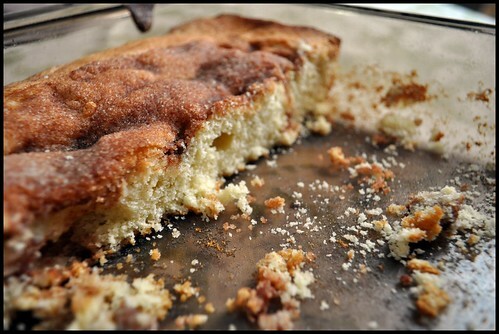 Sprinkle the cinnamon sugar over the top of the cake. Bake for 25 to 30 minutes until a tester comes out with only a crumb or two. Wendi–I love this, and I REALLY want a slice of it right now to finish off with my coffee. Can I walk on over to SW to get a slice? I should be there in about, oh, three hours. And then I’ll just pop into Whole Foods on my way back. Gotta get more butter before this next storm…I’ve got a birthday cake to make for friday! Beth, this is a lovely little cake. Unfortunately, we polished it off yesterday after wrapping up Phase 1 of Operation Shovel. But I’m betting that you have all the ingredients at your place already. This is super quick to fix especially since all the butter gets melted. I’m planning on making a bunch of these Retro Recipes that have been hanging out in my folder for a few years…and for a few decades at my grandmother’s house before that. You are really fortunate to have family recipes like that–I’m jealous! My maternal grandmother (who was a fantastic southern cook) died when I was 17, way before I was interested in cooking. My mom doesn’t cook AT ALL, EVER, so she never got any of those recipes. Makes me sad. Actually, this isn’t a family recipe. Years ago my grandmother gave me these random cookbook pages that she’d had for ages. I’m guessing they are at least fifty or sixty years old by now. One set came from Baltimore Gas and Electric. I’m glad I held on to them because now that I’m all about the kitchen it’s a nice way to look back. So Beth, and anyone else who doesn’t really have a history of family recipes (me included…remember, my grandmother was queen of the box cake mix) I encourage you to adopt these recipes as your own. Round One of SNOMG dropped about 24 inches. Round Two is supposed to bring another 10 to 20. I may not get out of my neighborhood until Spring. This sounds PERFECT for tomorrow morning! Maybe it will dull the pain of yet another 10-20″ of snow. Kathy, I just got in from shoveling and wish I had a piece of this cake right now. It looks delicious, and i love cinnamon. You think i can replace the sugar with a substitude? My husband and myself can’t have sugar. In theory you should be able to substitute Splenda for white sugar but since I’ve never baked with Splenda, I don’t know how it would turn out.